A gigantic tail of X-ray emission has been found behind a galaxy plowing through the galaxy cluster Zwicky 8338. With a length of at least 250,000 light years, this is likely the largest such tail ever detected. 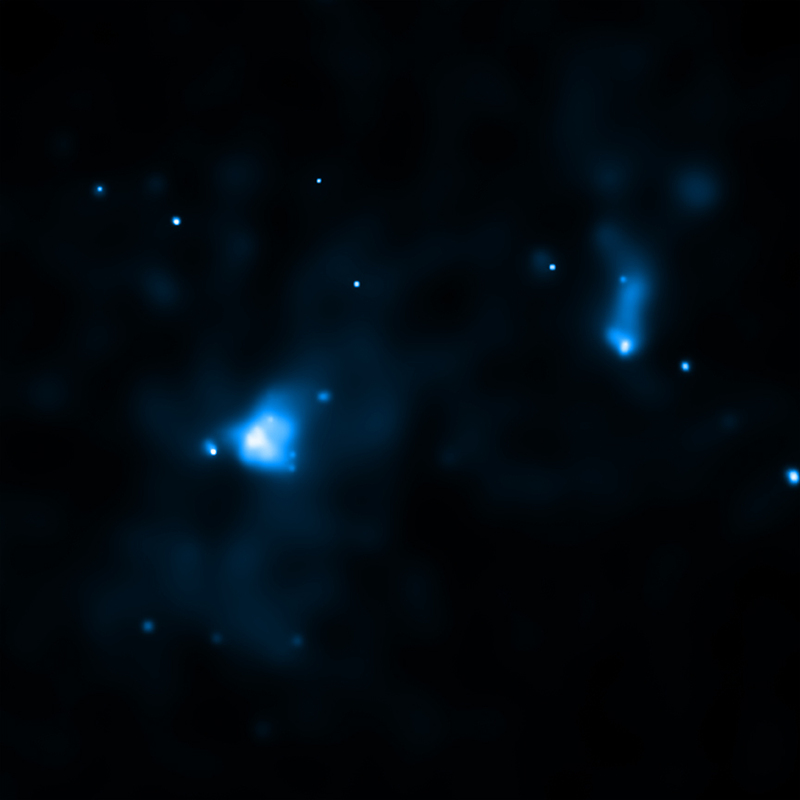 Scientists used Chandra to discover the tail, study its properties and learn how this X-ray tail affects its cluster environment. An extraordinary ribbon of hot gas trailing behind a galaxy like a tail has been discovered using data from NASA's Chandra X-ray Observatory, as described in our latest press release. This ribbon, or X-ray tail, is likely due to gas stripped from the galaxy as it moves through a vast cloud of hot intergalactic gas. With a length of at least 250,000 light years, it is likely the largest such tail ever detected. 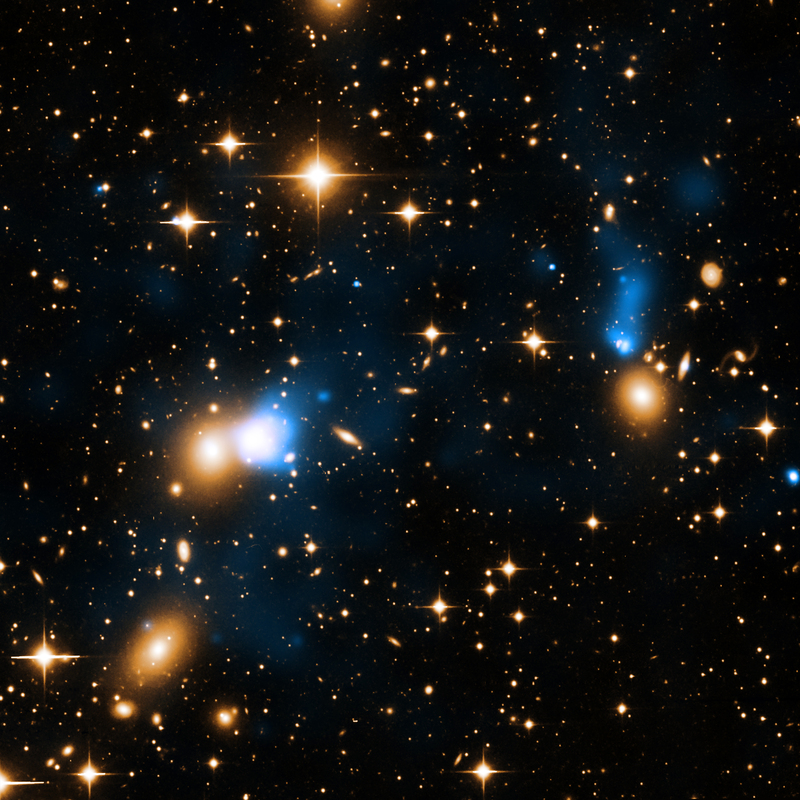 In this new composite image, X-rays from Chandra (blue) have been combined with data in visible light from the Isaac Newton Group of Telescopes (yellow) in the Canary Islands, Spain. The tail is located in the galaxy cluster Zwicky 8338, which is almost 700 million light years from Earth. The length of the tail is more than twice the diameter of the entire Milky Way galaxy. The tail contains gas at temperatures of about ten million degrees, about twenty million degrees cooler than the intergalactic gas, but still hot enough to glow brightly in X-rays that Chandra can detect. The researchers think the tail was created as a galaxy known as CGCG254-021, or perhaps a group of galaxies dominated by this large galaxy, plowed through the hot gas in Zwicky 8338. The pressure exerted by this rapid motion caused gas to be stripped away from the galaxy. 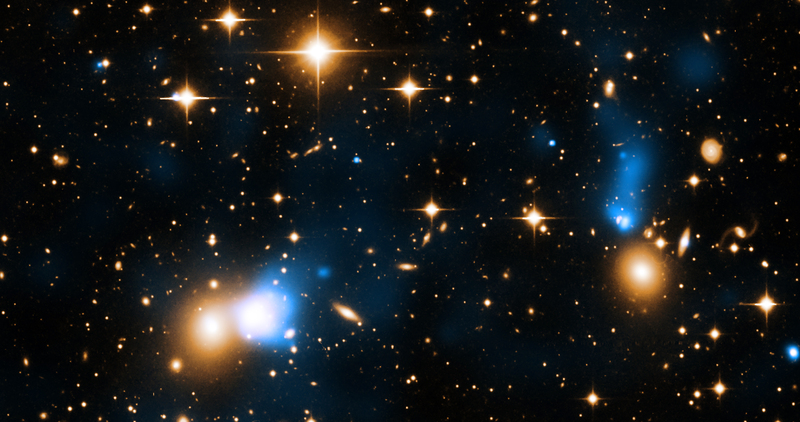 In images from Chandra and the NSF's Karl Jansky Very Large Array (not shown in composite), the galaxy CGCG254-021 appears to be moving towards the bottom of the image with the tail following behind. There is a significant gap between the X-ray tail and the galaxy, the largest ever seen. The significant separation between the galaxy and the tail might be evidence that the gas has been completely stripped off the galaxy. Astronomers were also able to learn more about the interactions of the system by carefully examining the properties of the galaxy and its tail. The tail has a brighter spot, referred to as its "head". Behind this head is the tail of diffuse X-ray emission. The gas in the head may be cooler and richer in elements heavier than helium than the rest of the tail. In front of the head there are hints of a bow shock, similar to a shock wave formed by a supersonic plane and in front of the bow shock is the galaxy CGCG254-021. Independent research involving observations at infrared wavelengths indicates that CGCG254-021 has the highest mass of all galaxies in Zwicky 8338. The infrared observations, together with models for how galaxies evolve, also imply that among the galaxies in the cluster, CGCG254-021 had by far the highest rate of stars forming in the recent past. However, there is no evidence for new star formation, possibly because gas has been depleted in forming the tail. The paper describing these results was published in the November 2015 issue of Astronomy and Astrophysics and is also available online. The authors of the paper are Gerrit Schellenberger and Thomas Reiprich from the University of Bonn in Germany. NASA's Marshall Space Flight Center in Huntsville, Alabama, manages the Chandra program for NASA's Science Mission Directorate in Washington. The Smithsonian Astrophysical Observatory in Cambridge, Massachusetts, controls Chandra's science and flight operations. Swift is managed by NASA's Goddard Space Flight Center in Greenbelt, Maryland. Coordinates (J2000) RA 18h 11m 26.75s | Dec +49° 49´ 47.35"
Observation Time 2 hours 13 min. A galaxy cluster located almost 700 million light years from Earth. About 680 million light years. X-rays from the Chandra, optical data from Isaac Newton Group of Telescopes. About 700,000 light years across. X-rays are blue, optical yellow.